The Canary Islands are special autonomous community of Spain and are located off the northwest coast of Africa, about 100 kilometres (Lanzarote and Fuerteventura are the closest to the mainland) from Morocco and the Western Sahara. The Canary Islands, although technically coming under Spain and part of the EU, are autonomous with their own government and taxation systems. The total population is roughly 2.1 million with most of them living on the islands of Tenerife and Gran Canaria. Each of the Canary Islands (and their satellite isles) are very different in feel. Some people love one island, but hate another. Beauty really is in the eye of the beholder and your island experiences may be totally different to the experiences of another. While some of them are real beach destinations, like Fuerteventura, others combine culture and nature, like Gran Canaria and Tenerife. Whereas La Palma is very beautiful with a tropical feeling. All the islands of the Canary Islands have a volcanic history, which explains the black beaches of the islands. All the sandy beaches you will find on the islands are man made. The islands lie in the Atlantic Ocean, about 100 to 400 kilometres from Morocco and Western Sahara. 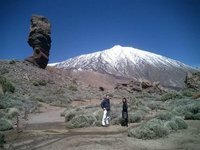 The Teide vulcano on Tenerife is the highest mountain of Spain, topping the Mulhacén in the Sierra Nevada by more than 200 metres. El Hierro saw the last volcanic activity on 2011, when an undersea volcano erupted just of the southern coast. The Canaries are split into 2 different communities: Santa Cruz de Tenerife and Las Palmas de Gran Canaria. Garajonay National Park is located in the center and north of the island of La Gomera. It was declared a national park in 1981 and a World Heritage Site by UNESCO in 1986. It occupies 40 km2 and it extends into each of the six municipalities on the island. The park is named after the rock formation of Garajonay, the highest point on the island at 1,487 metres. It also includes a small plateau whose altitude is 790-1,400 metres above sea level. It is the highest point of the island and the heart of the park. From here you can see all of the park as well as the neighboring islands of Tenerife, La Palma and El Hierro. The volcanic nature of the island of Tenerife meant that the land has few natural beaches. Those that exist are characterised by black sand created from the island's volcanic rocks. The demand for tourist sun-bathing space, however, has led to the creation of resorts and man-made beaches, with golden sand having been imported in some cases. Some of the best beaches of Tenerife are Los Gigantes and San Juan in the west and Fañabe, in the South with its golden sand, showers and excellent facilities. Also popular are Torviscas with its marina, Playa las Americas for its grey sandy stretches and los Cristianos' beach. Candelaria in the east has a small black shingle beach. Up north Puerto de la Cruz has a beach with fine black sand, and at Santa Cruz golden sand has been imported for its Terasitas beach. 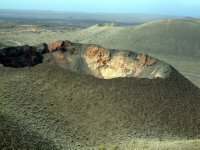 Timanfaya National Park covers a huge part of the central eastern part of Lanzarote. The moonlike landscape you see today dates back from the eruptions that took place between 1730 and 1736, and from a smaller eruption in 1824. Access to the park is prohibited apart from 3 footpaths, of which two need to be done with a guide, that can be booked at the Timanfaya visitor center. The other one is a footpath along the coastline, which is free for everyone. Needless to say, you should stay on the path and take litter with you. The most used option is however to drive up to the El Diablo restaurant, and to take of the bustours that start from there. Take the LZ-67 either from Mancha Blanca (from the north) or Yaiza (from the south) and follow the signs. Upon leaving the LZ-67, you will have to pay the entrance to the park (€8). The ticket already includes the bustour. The bustour follows a 14 kilometre-long road, which was build under supervision of Manrique, and passes by the main features of the park. Apart from the tour and some demonstrations (including burning scrubbushes, and pouring water in the ground to create an artificial geyser), there is not much more to do. While the rest of the world is recovering from Christmas Day and New Year’s Eve, and attempting to stick to their resolutions, the people of the Canary Islands are preparing for the next festival in their calendar - the Three Kings Festival. Los Reyos Magos, as it is known in Spanish, celebrates the Epiphany on the eve of January 5. Parades march through towns and sweet treats and fancy dress are in abundance. One of Europe’s most distinguished classical music festivals welcomes some of the world’s top classical performers to its stage each year from mid-January to mid-February. Stages are set up around the archipelago, with numerous acts playing simultaneously. Now in its 28th year, the festival provides a great alternative to spending the day relaxing on the beach, trekking, or kitesurfing. March sees the most colorful and most spectacular festival of the archipelago’s calendar occur. Carnaval takes place in February and is one of the best times of the year to visit the Canary Islands. No matter where you go, it is virtually impossible to escape it once in full-swing. The most elaborate celebrations occur in Santa Cruz and Puerto de la Cruz where locals pull out their fancy dress and put away their inhibitions. The dancing, drinking, and downright hedonism goes on for days and gives Rio de Janeiro’s Carnival a run for its money. June 23 sees Puerto de la Cruz, Tenerife, celebrate an ancient tradition inherited from the original settlers of the Canary Islands, the Guanches. Unless you know what is going on, you could quite easily think the people have gone a bit mad, as they take cattle down to the sea en masse to wash them. In addition, the Icod people set impressive decorations of flowers alight on campfires. Held in June, the Corpus Christi fiesta celebrates the establishment of La Orotava’s Eucharist (Holy Communion). The town is adorned in multi-colored sand and the community reenacts biblical scenes. The festival get everybody excited, with people of all ages joining the celebration. The celebration of the Canary Islands’ patron saint, the Virgin of Candelaria, is hailed on August 14 and 15. During these two days, many Canarians go on pilgrims to the city of Candelria to pay their respects. The Feast of Saint Candelaria is held on February 2. The Canary Islands' climate is perfect for a week of enjoying the sun and making trips across the islands. Summers are mostly between 25º and 30º during the day and still above 20 °C at night. Winters are about 6-8 °C colder on average though it's still quite warm, even at night. Note that the north of the islands generally are somewhat cooler and wetter than the south, but still fine. The individual islands in the Canary archipelago tend to have distinct microclimates. Islands such as El Hierro, La Palma and La Gomera lying to the west of the archipelego have a climate which is influenced by the moist gulf stream. As one travels east toward the African coast, the influence of the gulf stream diminishes, and the islands become increasingly arid. Fuerteventura and Lanzarote the islands which are closest to the African mainland are effectively desert or semi desert. In terms of its climate Tenerife is particularly interesting. The north of the island lies under the influence of the moist atlantic winds and is well vegetated, while the south of the island is arid. Most of the islands have direct flights from Europe, you can check the islands' articles for more information. The busiest airports are those on Gran Canaria and Tenerife. Gran Canaria Airport (LPA) is the busiest of the Canary Islands and dozens of airlines serve the island. Budget airline Ryanair has flights to a number of cities in Europe, while German based Condor and Air Berlin have flights as well. TUIfly, Thomson Airways and Thomas Cook Airlines serve a significant number of destinations as well. Tenerife is serviced by two airports: Tenerife North (TFN) and Tenerife South (TFS). These airports receive a lot of flights from all over Europe, Tenerife South Airport having by far the most possibilities. Lowcost airlines like Easyjet (from London and Manchester) and Ryanair have found their way as well, the last having most flights, including to/from Brussels, Dublin, Edinburgh, London, Glasgow, Madrid, Porto and Weeze (near Düsseldorf). Numerous other airlines serve Tenerife South though, the choice is wide. Tenerife North Airport (TFN) is located about 10 kilometres from the city. Tenerife North mainly serves other Canary Islands, cities in mainland Spain, and several cities in Germany. Also, two airlines fly here to/from Caracas in Venezuela. Lanzarote Airport (ACE) is the third busiest airports of the islands, follwed by Fuerteventura Airport. Trasmediterránea provides ferries from Cadiz in Spain to and from the Canary Islands. The Canary Islands are connected by a smaller airline called Binter Canarias, which also has a flight to Marrakech from a couple of the islands. A tram linking Santa Cruz bus station and La Laguna opened in 2007 costing €2.35 return in about 40 minutes. There are also plans for a train linking Santa Cruz and Los Cristianos. To rent a car is the best option for discovering the remote wilderness regions. Buses are the most common method of public transportation around the islands. Mile per mile they are expensive while compared to mainland Spain but you are not going to travel really far away. We are, after all, islands. Most buses in touristic routes are adequate. Do not expect the drivers to know more than a couple of sentences in English or German, though they would try to be helpful. Trasmediterránea and Fred Olsen, are the main operators between the Canary Islands of Lanzarote, Tenerife, Gran Canaria, Fuerteventura, El Hierro, La Palma and La Gomera. Canarian cuisine is a mix between Spanish, Latin and African cultures. Most of Canarian cuisine is a variety of fresh vegetables, fruit and fish, generally light meals, more easy to digest in a warm climate. Meat is usually consumed as a part of stews or as steaks. The local fish is quite good. You will find a wide variety of international recipes of fish and seafood, too. Two popular fish dishes from Tenerife are Caldereta, a meal with tomatoes, goat meat and potatoes and the Sancocho Canario, a salted fish, usually white, in a “mojo” sauce. The Canary Islands are Europe's only exporter of plantain bananas. They are famously delicious here. These bananas are usually fried and are also commonly found in the West Indies. Papas Arrugadas or papa sancochada - Potatoes boiled in very salty water until they are "wrinkly" -- hence the name -- and served with mojo picón, a spicy cold red sauce made with chili and garlic. These are often served as a tapa. Gofio - Grain flour used especially at breakfast or to accompany potaje, a local stew. Miel de Palma - Palm honey. Arepas - tortas made from fine corn flour filled with minced meat, cheese, or sweet mango. Mousse de gofio or gofío amasado - a desert made from gofio, miel de palma, and plantains. Wines - There are several brands of wines in the islands. North of Tenerife, La Geria in Lanzarote or La Palma have very appreciated vineyards. Rum - There are also well known rum factories, specially in Gran Canaria (Artemi and Arehucas). The 'ron miel' is a sweet liquor made from rum and honey. Barraquito - also called barraco, is a coffee speciality from the Canary Islands and particularly popular on Tenerife but also on La Palma. Beer - There are three locals beer factories (Dorada, Tropical and Reina). We have a comprehensive list of accommodation in Canary Islands searchable right here on Travellerspoint. You can use our map to quickly compare budget, mid-range or top of the range accommodation in Canary Islands and areas nearby. This is version 39. Last edited at 8:48 on Feb 1, 16 by Utrecht. 29 articles link to this page.